Traction: Initially various 4-4-0 types, after c.1911 tenwheelers, from around 1920 Pacifics C51, then C53, including the streamlined prototype C5343, possibly also C55, and then Pacifics C59. 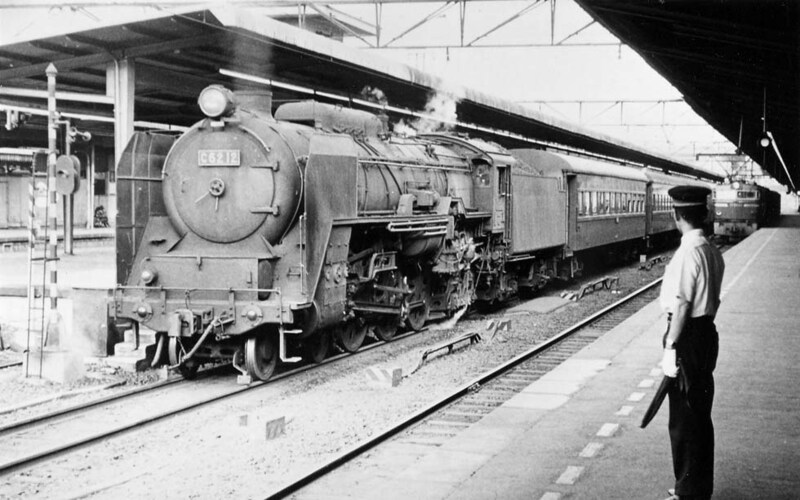 New 4-6-4 types C61 and C62 appeared in 1947 and 48. On the sections Seno - Happonmatsu and Yamakita - Numazu helpers were pushing, until c. 1925 Mallets. Only when 1,5kV dc electrification from Tokyo reached Numazu in 1934, expresses changed to electric traction. Later 20kV60Hz ac was chosen. Colors: Steam locomotives black, electrics initially brown, cars initially wood paneled, from 1929/30 all-steel, brown. 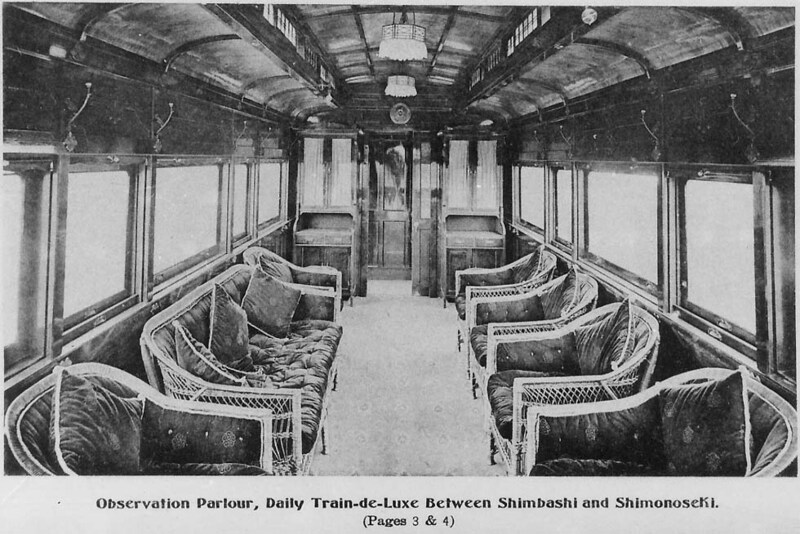 Between Shimonoseki and Tokyo on Cape gauge there remained several sleeping car trains every night, no. 2/1 Fuji starting at Oita on Kyushu island, but their future is uncertain. 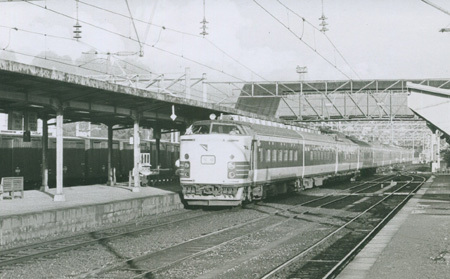 The steamer from Vladivostok connected at Tsuruga port with a special, consisting only of one sleeper (with guard's compartment) on Cape gauge to Tokyo, hauled to Tsuruga station by small freight engines. There it was attached to a train Tsuruga - Maibara, hauled by class 2120 or 2400 (0-6-2T, before WWI), then 9600 (2-8-0), D50 and D51 (2-8-2). At Maibara it was attached to the express Fuji (information by Izumi Mazuda). Already in 1940 the project of a 1.435 m standard gauge line Tokyo - Shimonoseki for 160, later 200 km/h started, but then it was stopped due to the war. It was intended as a fast connection with the ferry boats to occupied Korea and connecting trains for China. 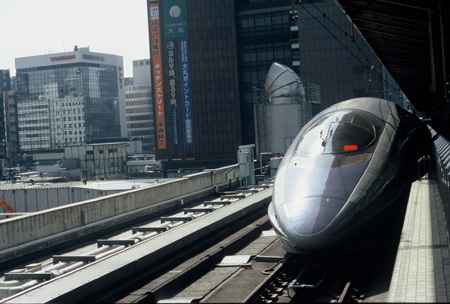 On Oct.1, 1964, the Tokaido Shinkansen Tokyo - Shin-Osaka was inaugurated, in 1972 the Sanyo Shinkansen, the extension southward to Okayama and in 1975 to Fukuoka Hakata, close to Nagasaki. At Shimonoseki it serves the ferry boat connections to Korea. The trains are departing at Tokyo Central. 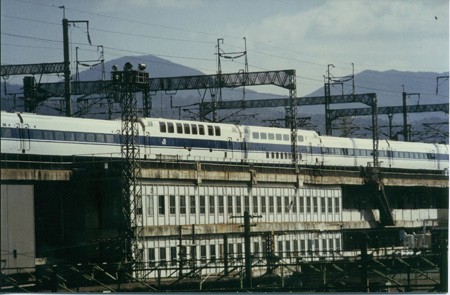 In 1982 followed the Joetsu Shinkansen from Tokyo westward to Niigata and the Tohoku Shinkansen northward to Morioka, later Akita and Hachinohe. In 1992 the branch to Yamagata was completed on an old track and therefore with a smaller profile, then extended to Shinjo. 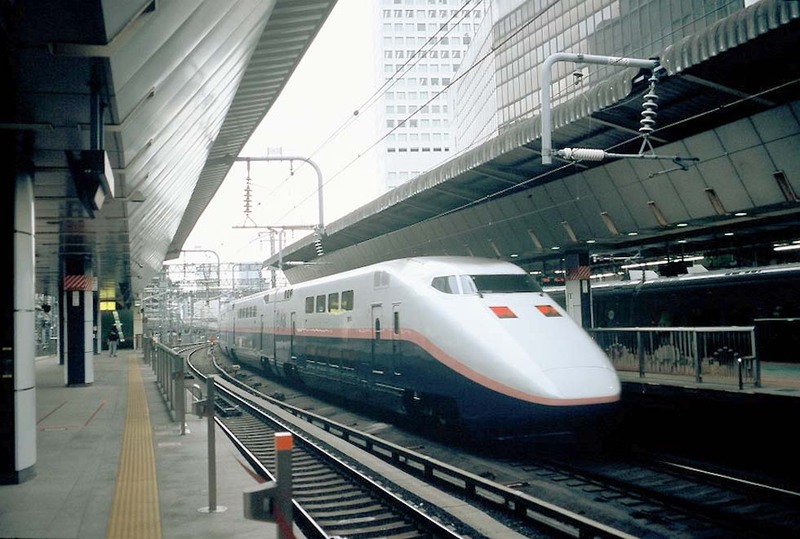 First the Niigata and Tohoku trains departeded at Tokyo suburbs, from 1985 at Tokyo Ueno and from 1991 the Joetsu & Nagana Shinkansen as well as the Tohoku, Yamagata & Akita Shinkansen trains are starting at Tokyo Central. 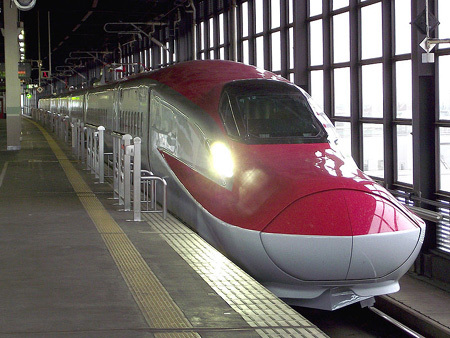 The Nagano line is expected to be extended to Kanazawa in 2015. The 54 km long Seikan tunnel northward to Hokkaido island has been built for Shinkansen profile, but equipped only with Cape gauge. 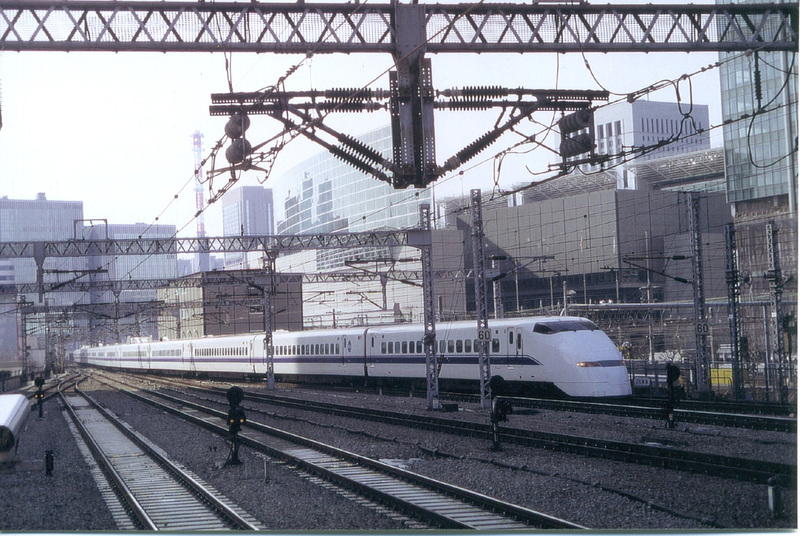 It did not achieve the expected traffic and became converted to a Shinkansen high-speed line for 360 km/h, announced to reach Shin-Hakodate in 2016. On Kyushu island in the south the isolated standard gauge Tsubame line is connected with the Sanyo Shinkansen, thus establishing a high-speed link Tokyo - Kagoshima Chuo over a distance of c.1,460 km. All the Shinkansen trains are electric multiple units for fast daylight services, from the beginning exclusively with distributed power. As the lines south of Tokyo are electrified with 25kV 60Hz ac and the northern lines with 25 kV 50Hz ac, different train sets were needed. With dual system trains that disadvantage for the passengers could be omitted. 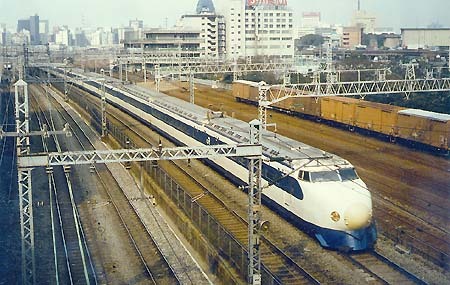 Speeds on the Tokaido line, initially 210 km/h, in 1992 did rise to 270 km/h with the ultra-fast "Nozomi" services by series 300, then 500 and 700. 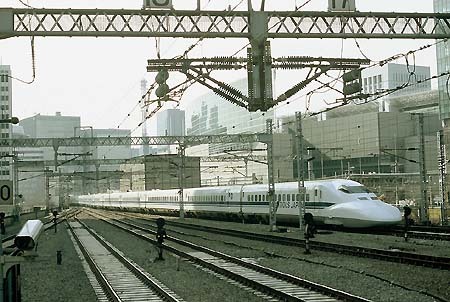 On the Sanyo section 285 km/h was allowed and the distance of 1,180 km between Tokyo and Hakata Fukuoka was covered in 5 hours. 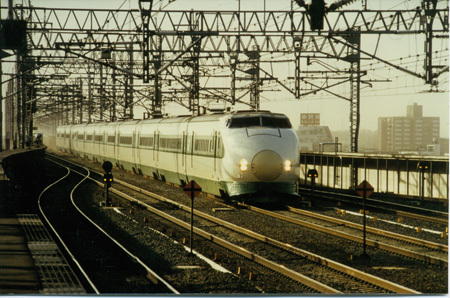 The fastest train became the series 500 of JR West with 18,240 kW power, introduced in 1997 on services from Tokyo to the utmost south. 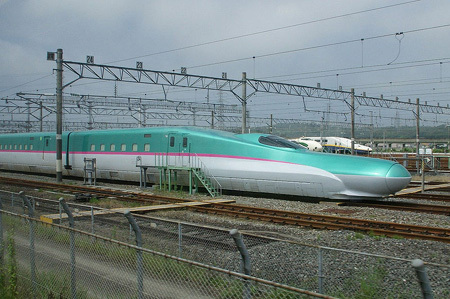 The striking "supersonic" appearance of that aluminum train in silver/grey colors with green Japan West Railway titles seemed to express its initial speed of 300 km/h and its capability of running much faster. Its exterior design was created by Alexander Neumeister, who has styled the German ICE3. 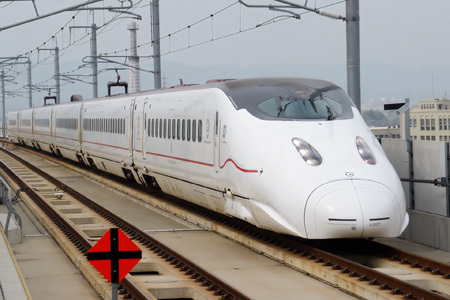 Composite materials, possibly tilting technology in connection with the Automatic Train Control and trains for still higher speeds up to 360 km/h became targeted. A first step was the N700 with tilting technology, introduced by JR Central. The sensation became East JR's Fastech360S experimental prototype, built for speeds up to 400 km/h. The "arrow nose" of that 8-car prototype looks like the Spanish "ant", but the "stream nose" at the other end has the beauty of the Nozomi 500. The tiny windows however are astonishing. 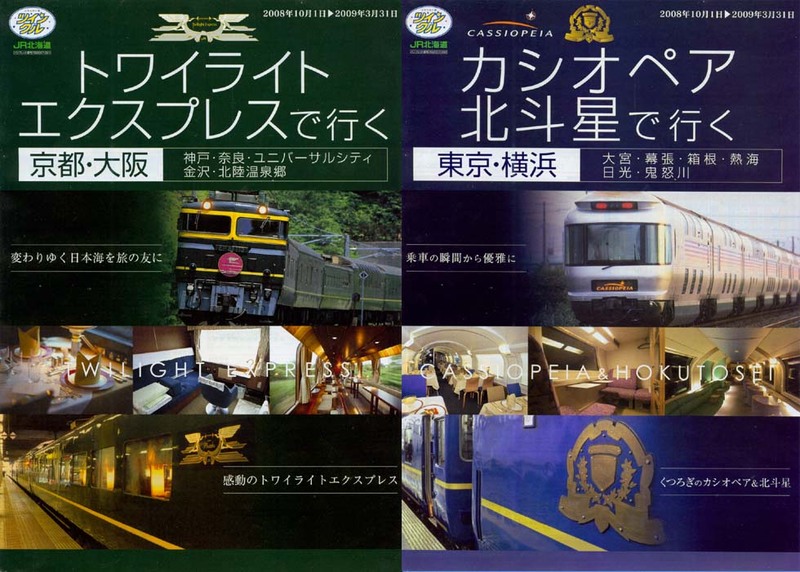 In 1997, indebted Japan National Railways was split up into several enterprises of Japan Railways, the most significant ones being Central Japan Railway with the Tokaido Shinkansen line, West Japan Railway with the Sanyo Shinkansen and East Japan Railway with the Tohoku Shinkansen. 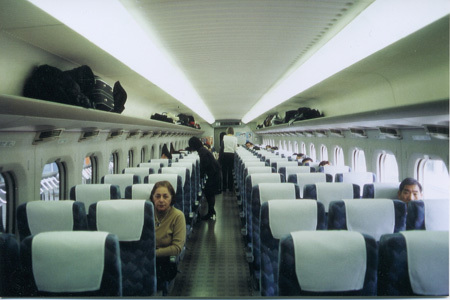 For Shinkansen passengers generally there is standard and "green" class, with an ambulant snack service, vending machine or bar. Only temporarily there had been twin-deck deluxe cars placed in the middle of series 100 (cars 8 and 9) and series 200 train sets. 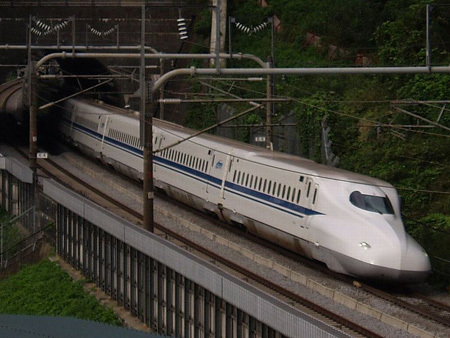 The option of Shinkansen night trains was studied, but rejected. Around 2008 even the end of conventional sleeping-car trains on the old gauge came into consideration. The interiors of the high-speed trains are designed in a clear style, with reversing seats and a closely spaced windows layout, providing a view from every window seat (contrary to some European expresses!). Trains of the Tokaido and Sanyo Shinkansen consist of 16 cars. On the lines north of Tokyo two shorter units often are coupled, e.g. an E3 with a twin-deck MAX. Standard color scheme on the Tokaido line is white/blue. On the Tohoku line it had been white/green, but then a multitude of paint schemes emerged. 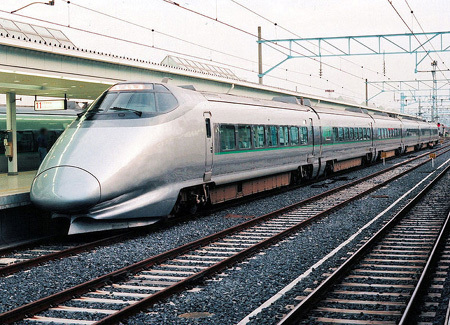 In 1995 the still faster SMLLMC ("Superconductive Magnetically - Levitated Linear Motor Car") MLX01 test unit was built, in consideration for a future Chuo Shinkansen to the south, using low-temperature super-conductors with liquid helium for a coolant. NASA in USA is developing HTS (high-temperature super conductors), easier to handle. At the start of the 21st century however, railway history still was made in Japan, far ahead of Europe, not to speak of America. In 2010 the government approved building the Chuo Shinkansen with maglev technology. The media reported in 2011 the intention of connecting Tokyo with Nagoya by 2027 and with Osaka not before 2045. Tokyo – Osaka, now 553km, is covered by the Nozomi within c.2 ½ hours. 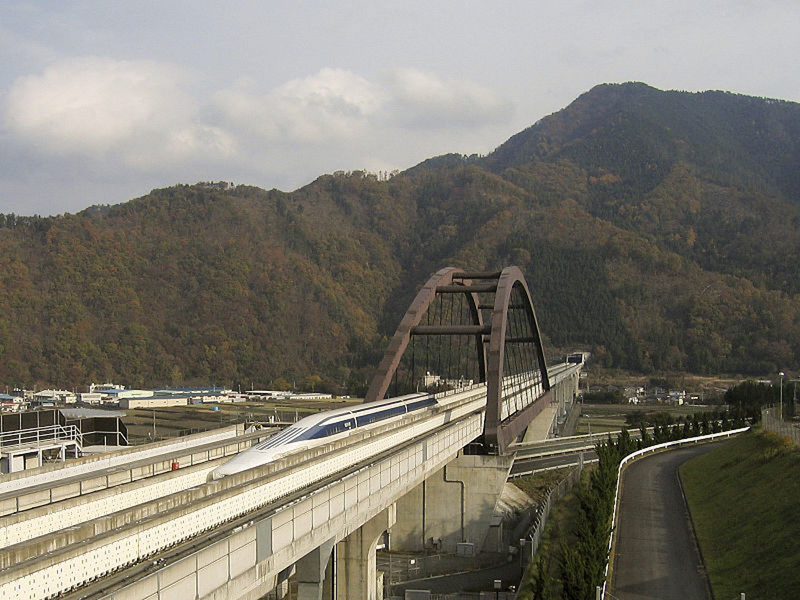 The maglev would do it in 67 minutes at a speed of more than 500km/h. In 2015 the 7-car test set L0 of JR Central achieved a record of 603km/h, surpassing the 581km/h record of the MLX01 in 2003. 85% of the Tokyo – Nagoya line is to be built in tunnel. Derivative of series 700 with tilting technology.